I have my own strong opinion about this subject but I would love to hear what others have to say. Should blooming Forsythia be pruned and shaped to cubes and balls and such ( I once saw an entire row pruned into the shape of an alligator ) or should they be left in their free-form state? My personal opinion is leave it natural. Every couple of years I take about 1/3 old growth to the ground. They stay very nice. I've seen the shaped balls, prisms, hedges, and such, and for the life of me, I don't understand how it can be done. Everytime I snip one teensy weensy branch, it shoots out four more. I have learned the hard way to clip a branch at its base. Free form is best. The color is a graceful intro to the rest of spring's surprises. But anything is better than a pile of overgrown, unkempt forsythia that has just a few sprigs of color. 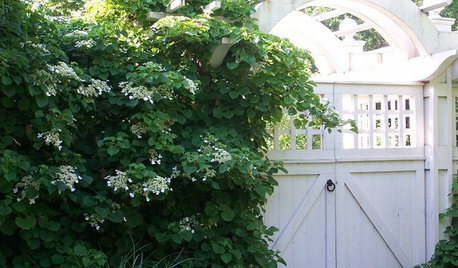 I like the natural look but do prune those long branches that grow four to five feet a season. I hate to see round balls, or neatly trimmed bushes of any kind. They just don't look natural. But that is just my opinion. I rescued a forsythia and pruned it into a standard. It resembles a weeping cherry but only in yellow. Some of the larger branches are weighed down on the tips to get them to arch downward. 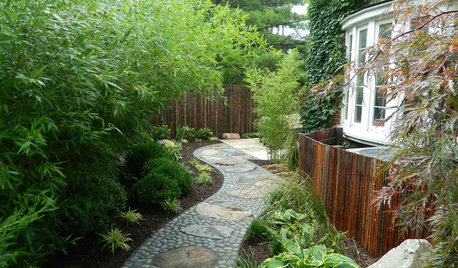 There was no room at this garden to keep a large forsythia bush but the standard works out very well within the space. For the record...anything boxed or balled looks ridiculous to me, unless it's some sort of maze or knot garden. I agree with the majority above - also prune after flowering or very judiciously before flowering in the spring to tame those longer/older branches from the base. I suppose if one is good at art design, a topiary might be interesting. As a side note, there is a forsythia on the border between my relatively new neighbor and our property. He took it upon himself to give it a flat top and a side chop(i.e. a box cut). Somehow, I need to break the news to him that his action is not the desired or preferred one. Maybe I should talk to his wife - she is the gardener. But, is it worth the risk of straining the neighborly relationship? I like the natural shape. There is a house near us where they have pruned theirs to look like a basket--and at Easter, they fill it with huge plastic eggs!!! Such a timely question! Last autumn we moved into a house where the former owner chopped at everything green. The forsythia, although not one of those terrible globes or boxes, is unsightly and hanging over a wall by the driveway. Tomorrow I'm going to cut it to the ground and we can both start over... together. There was a guy around here, named Bob, who lived at 808 of his street. He pruned his forsythia into either Bob or 808 (no one could tell for sure, but we sure guessed alot) and it looked so bad ... it was almost good. What I mean is that it performed a public service, gave people something noncontroversal to bond over (no one ever said it was good, but we veied for ways to describe how bad it was.) It became a local landmark, as in "When you see the most pitiful forsynthia to ever trouble the grass, turn left." So it was useful. On a whole I don't like obviously pruned forsynthia. The plant's habit is too open for it to look decent, let alone good. So that darn ugly Bob forsynthia will always have a slightly off-center place in my heart, though to be honest, not a very large one. I just hope it has been able to revert to its natural lovely state. Ohhhhhh Seeing this therad makes me so sad. I live on a cul-de-sac and have the nicest neighbors next door. They would help me with absolutely anything I could think to ask. The one thing we REALLY disagree on is the poor pathetic Forsythia in the middle of the Cul De Sac green space. I have told him every year for the past 8 years that I would love to take over the trimming of the Forsythia (I prefer a natural look too) and every spring in late Feb or early March he is out there hacking those poor things into globs. When I remind him that I said I would take care of them he says he figures I had forgotten since nothing had been done to them. The way he cuts them, they aren't really round, or square, or any shape that can be identified. They are globs. And since they are "pruned" in late Feb or early March, they are globs that only get about 6 blooms a year. He finally decided one was too big this year and cut the whole thing down. In it's place is a really ugly Rose of SHaron. I could just cry. He took a chain saw to it and cut it right to ground level then put stump killer on the stump. There isn't even a way for me to have saved it and moved it to my yard. The worst part is when you drive down our street, the cul-de-sac green space is the focal point of the entire street and it looks so stupid with the forsythis globs. So anyway, put me down as prefering a more natural look, but having to live next door to a forsythia hacker. Natural within reason is the way I like them. I just clip the long ones. 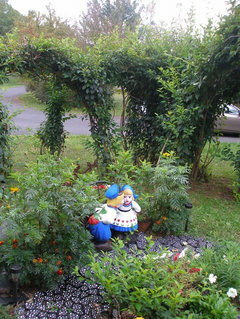 Remember in gardening to each his own so I will not judge others (at least I try not to). I love it au natural. I prune mine about every other year, it is so full of bloom that you can hardly see the branch. Some of my branches are putting out double blooms. Has this ever happened to any one else's forsythia? I vote wild, natural and flowing! Most of the ones I have that have been hard pruned have very little flowers-which is the prettiest thing about them! I've seen a lot of people around my home that have a hedge row of Forsythia cut to about 1 1/2' tall with only a few flowers at the tops of bare leggy stems. What's the point (purpose) of that? I don't know. I think that people who need to take a hedge trimmer to things should stick with arborvitae, boxwood, and things that were INTENDED to be clipped into silly shapes. clipping a forsythia makes about as much sense to me as buying a golden retriever, and expecting it to sit in its basket like an arthritic cocker spaniel! Forsythia is unfit for the sight of mankind if pruned. There is little in the plant world as beautiful as a natural fountain of golden forsythia in bloom, and it is near sacrilege in my opinion to prune it. Cut out old canes to the ground and prune off any unsightly stragglers at the base, and thats all. One of the first things I did after getting the new house was to chop down the mushroom shaped forsythia in the side yard so it could regrow. This year it's got a few blooms, next year should be perfect. I should post a few pictures of some of the forsythia lumps around here.... I can only dream of balls and boxes, what I see are mostly lopsided mushrooms and deformed shapes that I can only describe as "drumsticks". My neighbors are committed to keeping their bushes in line..... I just wish it was a sortta straight line, or at least some normal shape. I am very passionate about this subject - leave them in their natural form! (Some pruning is fine, but only from the ground). I have just received some cuttings of Forsynthia, how do I go about planting them? Still, I was suprised that I didn't mind it at all, although I knew it would be alot of work to maintain. ;-) It is literally acting like and cut like a privet hedge and was not scraggily or full of holes like other sheared and/or shaped forsythia I have seen in the area. Jim, I've found this thread to be very interesting and have enjoyed reading everone's differing opinions. To prune or not to prune???? Well, I have to say that I've seen many natural forms that look beautiful. But on the other hand, I've seen several natural specimens that look horrible, like a giant mess. And as far as pruned, sheared, or shaped Forsythia....well, that all depends. 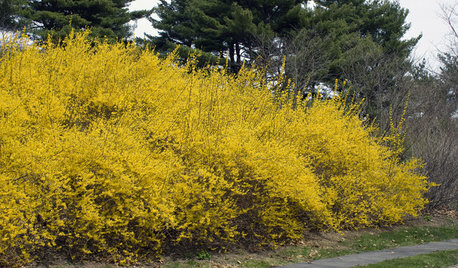 I can't stand to see Forsythia, or any other shrub for that matter, given a "flat-top" haircut. You generally see this in foundation plantings. Sometimes the whole thing will be squared off. Don't really prefer that. 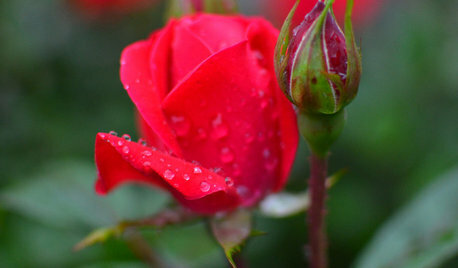 But there is a correct way to prune things to keep the size in check and also maintain a "natural look". Pruning is not always bad. 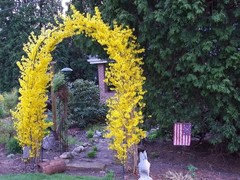 I have been working on this "Forsythia Arch" for 8 years now. I started with a tiny piece about 6 inches long. Once it began to grow, I took one of the longer branches and layered it a few feet over. After about 8 mos or so, I cut the "new" plant away from the mother. I then installed a heavy metal arch as a "template". I have been pruning this Forsythia about twice a year with a few extra snips here and there. I think by next year it should really fill out and look great. Then I will remove the metal arch. It has been a fun project, but has taken what seems like forever to get to this point. This was the first year I really got to see it put on a show. I have just received some forsythia cuttings and am unsure how to go about planting. That's cool mamabird, also nice member page! Here is an example of a VERY naturalized forsythia bush. This is at an old PA farmhouse which was abandoned and is being renovated by the 6'3" + gentleman in the picture. I had him stanbd in front of the bush to give you an idea of how LARGE this thing is...enjoy! A vote here for no pruning. But that said...I love that arch. Way cool! The huge natural one is just gorgeous. I'll bet it's full of birds. And the hedged forsythia is suprisingly handsome, too (I love hedges). I've never seen it trimmed like that. On my way to church there is an interestin forsythia hedge. It's mostly natural though controlled and the bottoms are trimmed up to form arches between the bushes. It looks pretty cool. It has the nice unpruned look but it's open and less solid than it would be without the arches. The whole hedge spans two properties and one homeowner doesn't do the arches. That part of the hedge is much heavier looking and to me less attractive. LOL...your Forsythia looks like ours! Oh that's not mine! LOL! This was at an abondoned farmhouse which is in the process of being renovated by a friend. That bush is as deep as it is wide...on both sides of the driveway! Sorry the links are broken now, I've removed the images from the web site. We have a forsythia bush about 20 years old. When we moved in to this house it bloomed the first year. Since then we have been prunning it on top to keep in check height wise. It has stopped blooming. Is there a right time of the year to do this or is it just too old? Hi Sunrisefaily! Since they are such fast growers, some prune them at any time during the year to get them under control. 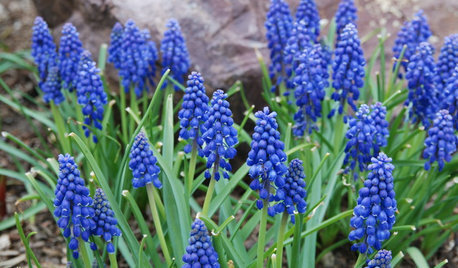 However as a spring bloomer, it is usually recommended to prune during (you can bring the branches inside and place in a vase) or just after bloom. 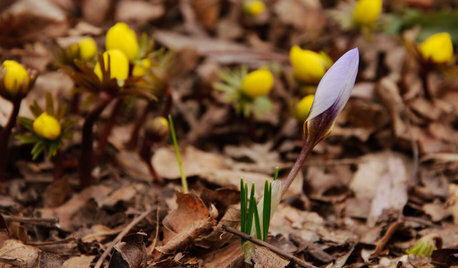 After that, it will sprout all new growth through the rest of spring, summer, and into fall, and would have set the new flower buds for next year by late summer. I bought my home last December and the previous owner created a "hedge" of forsythia at the front of the property. 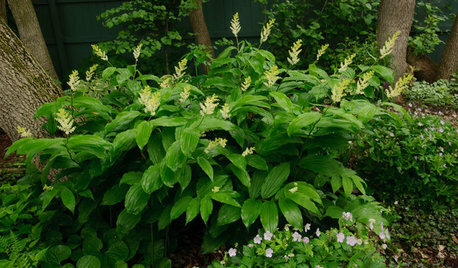 This spring I had very few blooms with lots of woody growth about 3 ft. high. Besides just letting it grow, is there anything I should be doing to restore it to its former glory?? What might have happened was that the new growth (which has the flower buds) from last year was all sheared off right before you had moved in. Therefore it lost its flowering mechanism for this spring since these bloom on previous season's wood. If you want it to bloom next year as a hedge, you just have to make sure that you don't prune this year's growth late in the year (although you can head it back if you want it to keep its shape). I'd just like to point out that I started this poll a year ago...amazing! I wonder if I should go in and total up the results? Thanks so much for the info Jenny! Here's hoping that my forsythia will be glorious next year. Jim - LOL Doesn't seem like a year has gone by! 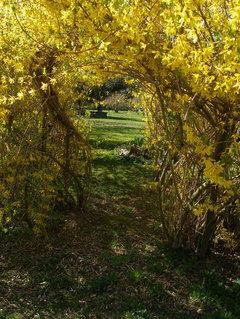 regwizard - Forsythia are pretty forgiving and the way it sounds like it was pruned, you could let it grow out and up about 1 - 2ft or so and then head back at the final height that you want. That new part is what should bloom next year. Sometimes you have to do that with forsythia (a rejuvenation pruning) in order to get nice longish blooming stems. Good luck with your hedge! I love my forsythias. I have about 20 in a long row. I top it at around 8 1/2 feet. It is around 30-40 yards in length and the home of robins and catbirds. They completely watch over my garden and take care of all my insects. Forsythia, a great place for bird watching. We have too many forsythias, so I regularly go around and BREAK off the branches and reach up and inside and break or cut the thick canes. I am particularly mindful of the boughs that touch the ground - they will root easily! I have been working on several arches myself. They can be woven and controlled. 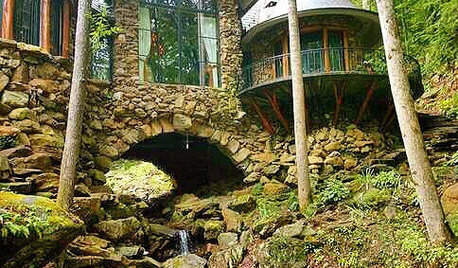 They also make interesting caves. That being said, if I didn't already have them, I would not plant them. They are tough old birds! We had a forsythia that was taking over the yard and I really wanted to reclaim the space. It was a brutal battle against huge clumps of heavy branches. I clipped from the bottom and would pull out each long branch. As I collected them I also trimmed off any other growth so that I ended up with a large pile of very long, wavy sticks for another project I had in mind. I took out my big box of bungee cords from the dollar store and started wrapping armfuls together, pushing and shoving them into arches. I won't lie, this is an ongoing battle between me and the forsythia which is determined to touch ground. When I go out to wrestle my nemesis, it immediately attempts to blind me with little leaves and such. By the time I'm done, my shirt is full of leaves and branches as is my hair. But I have it shaped now and it's just a matter of maintenance. A few years later it has grown into a magical tunnel of yellow in the spring. 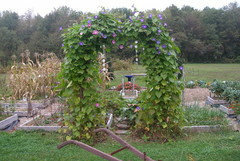 The branches that were taken down provided our garden with a lovely archway covered in morning glories. This was also an easy project. We just laid them down so they were all bending in the same direction, divided the pile in 2, bound them together with colorful twine in a few places, stood each pile in a couple of old barrels we had partially buried and filled with the abundance of small rocks from our garden. For the top we took a few of the thicker branches and laid them in between the bundles across the top, also securing with twine. Though they are brittle now, they are still holding their own 4 years later, despite hurricanes and snowstorms. I did re-cover the old twine with new. At Christmas it was wrapped in lights and looked quite pretty. 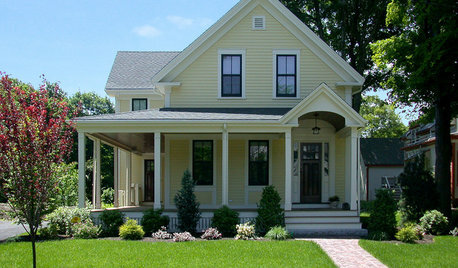 Letting go when a new owner dares to change a beloved house's look can be downright difficult. Has this ever happened to you? POLL: Do you have an aquarium at home? POLL: Would a kitchen renovation change your food choices? Fall trimming in this weather?